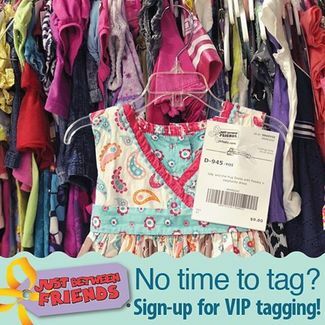 No Time to Tag Your Items for The Upcoming JBF Huge Kids' Sale of Colorado Springs? CLEAN OUT AND CASH IN! Let Our Expert VIP Taggers Do The Work For You! REGISTRATION CLOSES ON April 1st. RESERVE YOUR SPOT NOW! VIP Tagging Consignors make 40% of their gross sales. The consignor fee is $20 for the first 100 items and an additional $5 per 100 items. Items that are VIP Tagged will be reduced on 50% off day and can be either picked up at our designated pick-up time or donated at the end of the sale to our Charity Partner. VIP Tagging Consignors are eligible for a Presale Pass. Helper Shifts are available to receive an earlier shopping pass but not for a higher sales percentage. There is a 200 item minimum requirement or $200 worth of items to be tagged and a 1000 item maximum per event. Items should be clean, current, complete and clothing should be sorted by gender and size before dropping off to assigned VIP Tagger. We charge $.25 per No Thank-You Item (stained, worn, damaged or outdated) and these items will be donated. After drop off, the assigned VIP Tagger will enter the items into www.myjbftags.com. Once items are entered, the VIP Tagging Consignor has 48 hours to edit/approve all barcode price tags for their items. After 48 hours no changes may be made to the sale items/tags. Consignor Pickup: VIP Tagging Consignors may pick up their check during designated pick-up times per event. Checks not picked up during this time will be emailed to the VIP Tagging Consignor.